Ministry of Electricity and Water Wins Indoor Football Championship! 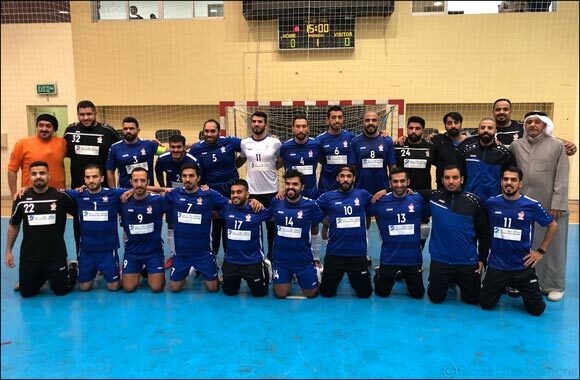 Kuwait – 7 February 2019: Burgan Bank, one of the largest supporters of the sports movements in Kuwait, recently sponsored the Ministry of Electricity and Water team who participated in the 2019 Ministries Indoor Football League that took place at Martyr Fahd Al-Ahmad Hall. The Ministry of Electricity and Water team won the championship league title. During the awards ceremony, Deputy Director in the Public Authority for Sport, Mishaal Al-Hadba congratulated the Ministry of Electricity and Water team for their stellar performance in winning the title third year in a row as well as the Kuwait National Guard and Ministry of Awqaf and Islamic Affairs teams for their victory in second and third places. The final match was attended by Deputy Director in the Public Authority for Sport, Mishaal Al-Hadba, Undersecretary of the Ministry of Electricity Mohammad Bushehri, Director in the Public Authority for Sport Hamed Al-Hazeem and representatives of the participating ministries. The Bank's support of this initiative falls under its dynamic full-fledged community program entitled ‘ENGAGE’ – Together to be the change. This program sheds light on important aspects affecting every segment of the society by promoting social welfare through educational, cultural and health driven initiatives. Burgan Bank’s approach to 'ENGAGE' begins with a vital principle that as a leading Kuwaiti financial institution, its conduct and policies should be aligned with the needs and interests of the community.